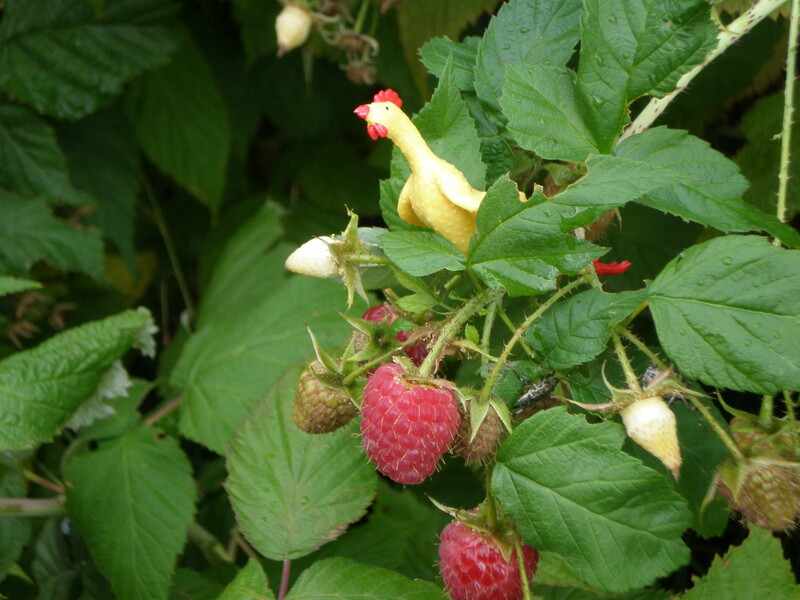 Our raspberries have gone wild. I picked a bucket before the rightful owners of our raspberry bushes (the bumblebees) shooed me away. The second blooming of the season is even more appreciated than the first, I think because it takes me by surprise. I went to a Fun. concert, with MH and Belle and three of Belle’s friends. It had been some time since I’d been to an outdoor/festival seating style concert. McMenamin’s Edgefield’s amphitheatre is a nice venue, even when you’re sitting at the way way way way back of the lawn (nasty traffic getting there – Portland at rush hour, grrrrr). We staked out our site, set our tarp and lawn chairs down, got dinner from the concessions area (the usual McMenamin’s grub, plus some variations) and managed to enjoy the last few songs of the opening act. Before the headliner came on Belle & friends decided to go up to the standing-in-front-of-the-stage area, where they stayed for the remainder of the show. Except, it was an outhouse. Outhouse, bathroom, let’s not quibble, but what the heck — why the need for any kind of sign? 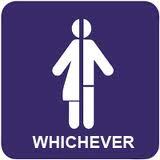 Can outhouses even have a gender? Thousands of concertgoers = dozens of outhouses, lined up in a row, in the designated area. It was all neat and orderly. People waited in line in front of outhouses which appeared to be identical, save for the hand-scrawled, Gender Neutral Bathroom signs taped to four of the outhouses’ doors . Taking advantage of the kind of camaraderie possible only between persons with full bladders, I asked the gent standing next to me if he knew what was special about a “gender neutral bathroom” and pointed toward the nearest one, a mere four Honey Buckets away from the facilities gent & I were waiting for. He said he had no idea, but I could tell I’d piqued his curiosity. We both watched as a gender specific (female) person exited the nearest GN outhouse. The woman, displaying impeccable outhouse manners, held the door open for its next occupant (another gender specific person – this one male), which allowed the gent and I a peek inside the GN outhouse. A central (pit) toilet, a side urinal and a wall-mounted hand sanitizer dispenser – it was the same as all the others. There were no gender specified outhouses; everyone stood in line and took the next available facility. I was mystigasted. I thought all outhouses were for all genders. Silly moi. I guess all outhouses are equal, but some outhouses are more equal than others. K is back at college and Belle is back to high school – for her senior year. As usual, I salute the arrival of September, and look forward, this September, to begin serious work on The Book That Will Not Be Called a Sequel to The Mighty Quinn. 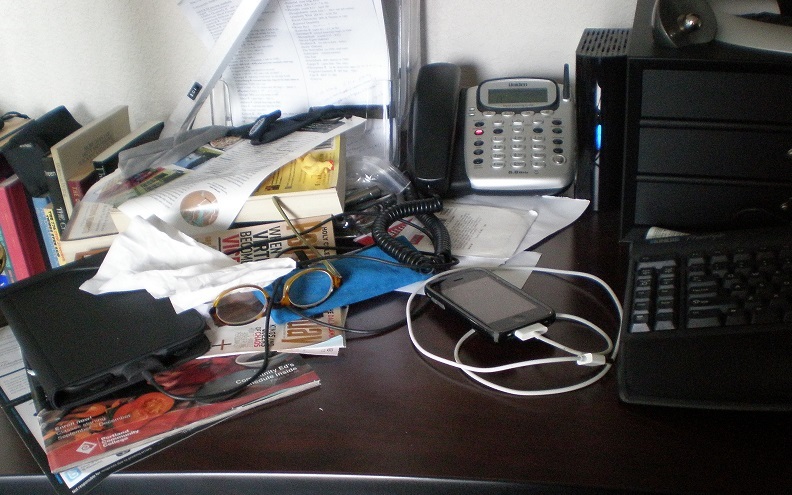 But…whose desk is this? This is not my desk. How did this happen? I am, in general, a tidy, organized person. This is not my desk. This is my desk. There shall be little commentary from moiself, at this time, re a certain no-win international situation. The army/government, the rebels…six of one, half a dozen of everybody else. Syria, Schmyria: there are no good dogs in that fight. I’ve discovered, via my visits to other blogs that either regularly or occasionally feature posts about culinary matters, that I’m not a true blogger until I have posted a picture a blogged-about meal along with the recipe. Earlier in the week I made a pesto with basil and Italian parsley, no pine nuts, dab of ricotta, heavy on the lemon juice & light on the olive oil, a combination which might have prompted a visit from the PPP (Pesto Purity Police), but all was peaceful. Forgot to take a picture of that concoction. Thursday is pickup day at the CSA (farm). I’ve been experimenting with veggie fritter/pancakes all summer. Here’s what I did with some of this week’s bounty. You could vary the spics; I was going for a mildly Indian flavor. This week I, without the promised help from the afore-mentioned High School Senior Daughter (who did show up 10 m into the appointment and helped me soothe some anxious kitty nerves),  I survived was successful in corralling and crating our three indoor cats, and transporting them to their annual veterinary exam/vaccination appointment. Yet Another Reason to go on Living: Bill Nye The Science Guy is hoofing it to the next (17th) season of Dancing with the Stars. Put on your boogie shoes, and may the hjinks ensue. Actually, he endured nothing like the treatment he gave them, as he had regular meals in prison and was not beaten, raped and impregnated by his guards. 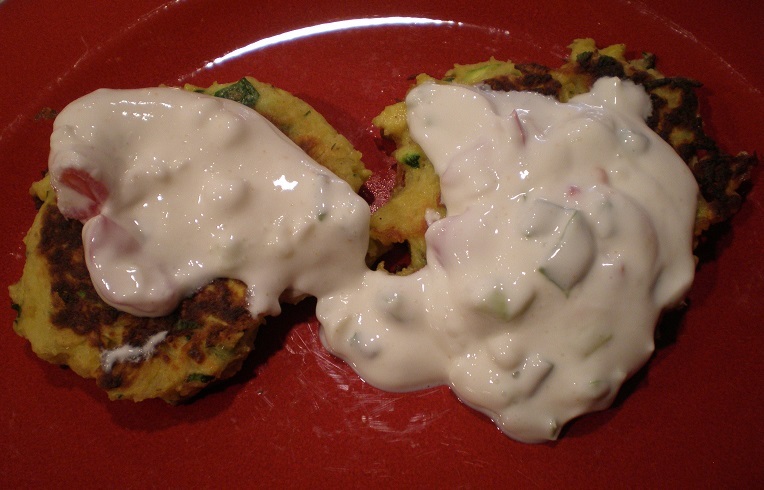 An Indian yogurt cheese. Can be purchased in some organic/specialty stores, or made at home – a fun and relatively easy process. Try making paneer at least once before you die. But not right before you die. For some reason they really, really don’t like having their temperatures taken, despite the pretend exclamations of excitement – (“Oh, goody, it’s temp time!”) we emitted when the vet prepped the rectal thermometer). You must visit this site. 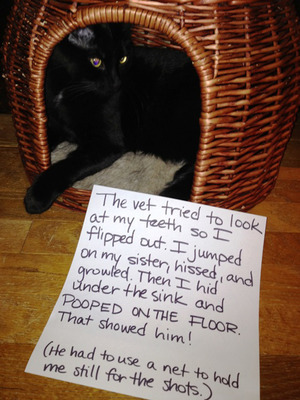 Invaluable entertainment, for both cat lovers/owners and the feline-indifferent.